When you first go through the process of registering your iPhone, making settings for your location, using iCloud, and so on, at one point you will see the screen below. To activate Siri at this point, just tap Use Siri. As you begin to use your phone, iPhone reminds you about using Siri by displaying a message. Tap General and then tap Siri. 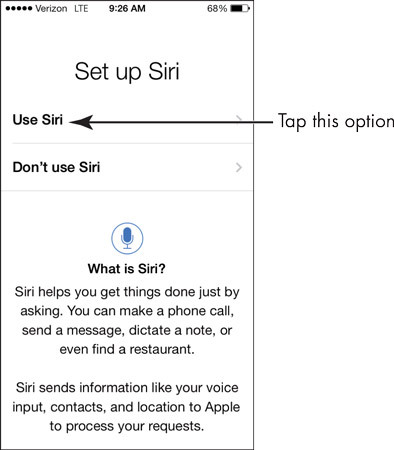 Tap the On/Off switch to turn Siri on. If you want to change the language Siri uses, tap Language and choose a different language in the list that appears. To change the nationality or gender of Siri’s voice from American to British or Australian, or from female to male, tap Siri Voice and make your selections. 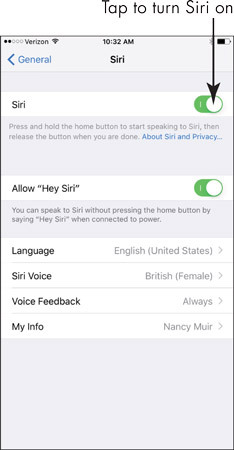 If you want to be able to activate Siri Hands-Free (a feature that arrived with iOS 8), tap the Allow “Hey Siri” switch to turn on the feature. With your iPhone plugged into an outlet, car, or computer, just say “Hey, Siri” and Siri opens up, ready for a command. In addition, with streaming voice recognition, Siri displays in text what it’s hearing as you speak, so you can verify that it has understood you correctly. This streaming feature makes the whole process of interacting with Siri faster. If you want Siri to verbally respond to your requests only when the iPhone isn’t in your hands, tap Voice Feedback and choose Hands-Free Only. 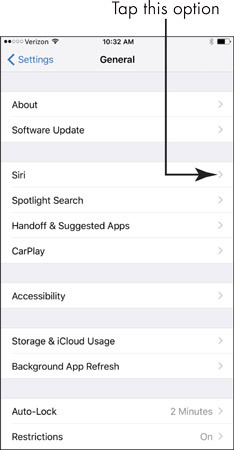 Here’s how this setting works and why you might want to use it: In general, if you’re holding your iPhone, you can read responses on the screen, so you might choose not to have your phone talk to you out loud. But if you’re puttering with an electronics project and want to speak requests for mathematical calculations and hear the answers rather than have to read them, Hands-Free is a useful setting. Siri is available only on iPhone 4s and later with Internet access, and cellular data charges could apply when Siri checks online sources. In addition, Apple warns that available features may vary by area.